The title is not a spelling error- this zucchini was stuffed with zucchini ... and some onions and cheese and then topped with bread crumbs. It was late in the weekend, and there wasn't much left to choose from in the fridge. I found this zucchini and not much more. But it turned out to be a super simple, nice, light meal. As I write this, I'm envisioning many variations of this as well- You could easily drop in some ground sausage or turkey to make this more protein rich; or try adding some whole wheat couscous! Use what you have available, certainly some roasted red peppers would be great with the goat cheese, or roasted poblanos with a dash of hot sauce would give it a great kick! This is probably more of a summer dish and would be fabulous finished off on the grill, but in the dead of winter- it was a real nice change from all the heavy, hearty meals. Lighten up one meal and you may be surprised at how fat and happy you are! Bake 1 large zucchini for about ten minutes to soften. Cool slightly. Cut a small slice off one side of the zucchini- this will be the bottom, to help stabilize it. Now cut out the top and carve as much of the inside as you can, leaving all the walls in tack (think of carving a pumpkin.) Rub the inside of the zucchini with olive oil and pepper. Chop all the insides of the zucchini. Also chop about the same amount of red onion. Sautee the onion in olive oil until they begin to soften. Add the chopped zucchini and 1 chopped garlic clove. Sautee for few more minutes and add 1 tbls fresh chopped thyme. Toss with about three or so tablespoons of goat cheese and stuff into the zucchini. 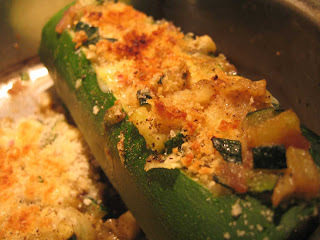 Put the stuffed zucchini back in the pan you sauteed with, sprinkle the top with Panko bread crumbs (or homemade crumbs), a drizzle of olive oil and salt and pepper. Broil until the bread crumbs are browned and the cheese is bubbly. Use this as a full meal, or get small zucchinis and use as a side dish!